BYOBI is an acronym I first heard on a telephone call with a VP of Technology at a large corporation. The word is almost unknown today, but I think that it will be one of the largest trends to impact data in the next five years. BYOBI means Bring Your Own Business Intelligence. This VP of Technology was struggling to enable the sales people, marketers, engineers and others within his business to access the data they needed. The monolithic solution that they had adopted, (I can’t remember if it was MicroStrategy or Cognos or BusinessObjects), satisfied the needs of the one department that had catalyzed the purchasing decision many years ago. Several years on, his team had become inundated with custom data requests that the tools failed to answer and petitions to purchase new types of software. Unfortunately, his data architecture just wouldn’t allow him to respond to those needs. The image below is a simplified schematic of his architecture. This is the way business intelligence software used to work. On the left-hand side, engineers transform data from handful of databases kept on premises into an internal data warehouse. The data is then modeled and optimized for answering the questions the business has today. Reports and visualizations are then built for easy access. Inevitably, those questions will evolve and new ones will crop up. But at design time, those questions are impossible to anticipate. Inevitably, the BI tool fails to live up to its potential and teams can’t access the data they need. What’s worse, with the explosion of cloud and SaaS software use, the data fragmentation problem has exploded. Now, company data isn’t stored across a collection of databases within the company’s firewalls, but is scattered across thousands of servers all over the world. A diaspora of data. Nevertheless, teams within the company still need to access and process and analyze that data irrespective of where it resides. Faced with this problem, he decided to dramatically transform his data architecture into BYOBI. The image below illustrates BYOBI architecture. End users decide which reporting/visualization tools to use. Cloud/SaaS databases are now a key data contributor, in addition to the on-premises databases. The different layers of the BI stack have become unbundled and line of business users decide which tool to use, instead of IT. 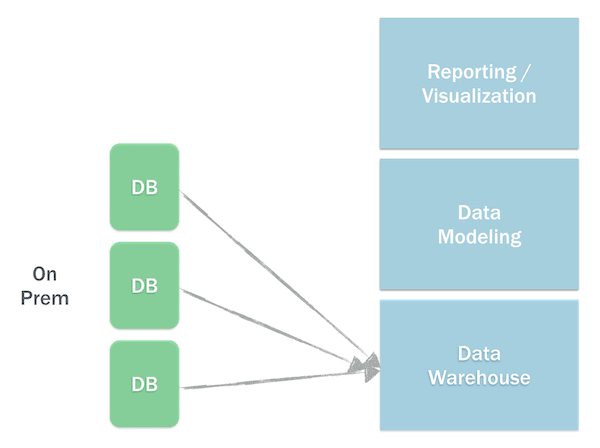 Reporting and visualization occurs primarily on raw data, not data that has been transformed or optimized a priori. 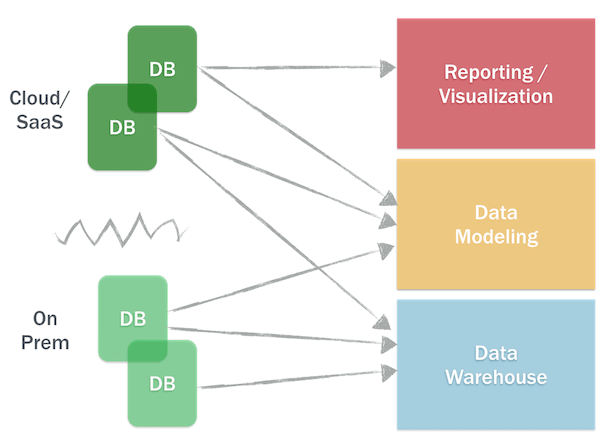 Two key innovations enable this tectonic shift in BI, faster databases and better data modeling. Redshift, BigQuery and others are taking the data world by storm because their performance benchmarks are staggering over huge data sets. This enables next generation BI tools to provide real-time responsiveness over all the data, not just a sample of data, as in the past. Data modeling enables data scientists to encode the structure of and relationships among data sets into one compact file and then enable everyone within an organization to ask and answer questions of the data in the correct way, without help. Emboldened by newfound confidence of having one consistent source of truth, the organization becomes empowered to be more decisive and move faster. With this BYOBI architecture, end users decide which tools are the best ones for their use cases. IT’s responsibility becomes data access enablement rather than data request fulfillment. Consequently, the entire team is happier and more productive. BYOBI will become the dominant data architecture over the next ten years. As this shift happens, the newcomers like Looker, which provides novel data modeling and data exploration tools will take significant share from the hegemons of legacy BI. For proof of this coming fragmentation in BI, look no further than Tableau’s success. Now a $4B company serving more than 10,000 customers, Tableau proved end users could influence BI buying decisions. But this is just the beginning of the BYOBI trend. BYOBI will disrupt the $13B business intelligence world, creating massive share shift, giving rise to new, massive companies and enabling teams all over to run their businesses more effectively.